Lisa loves John: Wish List: All Things Green! Oh my gosh I am off gluten and I really want to nom nom nom on the all of those foods. That purse is gorgeous!!! Have you had tieks? I haven't tried them yet but I hear so many people raving about them. Happy St Patty Day! I need all these things in my life!! I love, love those green Tieks! I've wanted a pair for so long but part of the problem is deciding on a color since they are all so gorgeous! Love the scarf and that phone case… Happy St. Pat's! The ombre cake is so pretty and I love, love, love that phone case! Love the scarf, earrings, and phone case. I hear you on budget mode - me too, and it's so hard when the seasons are changing! 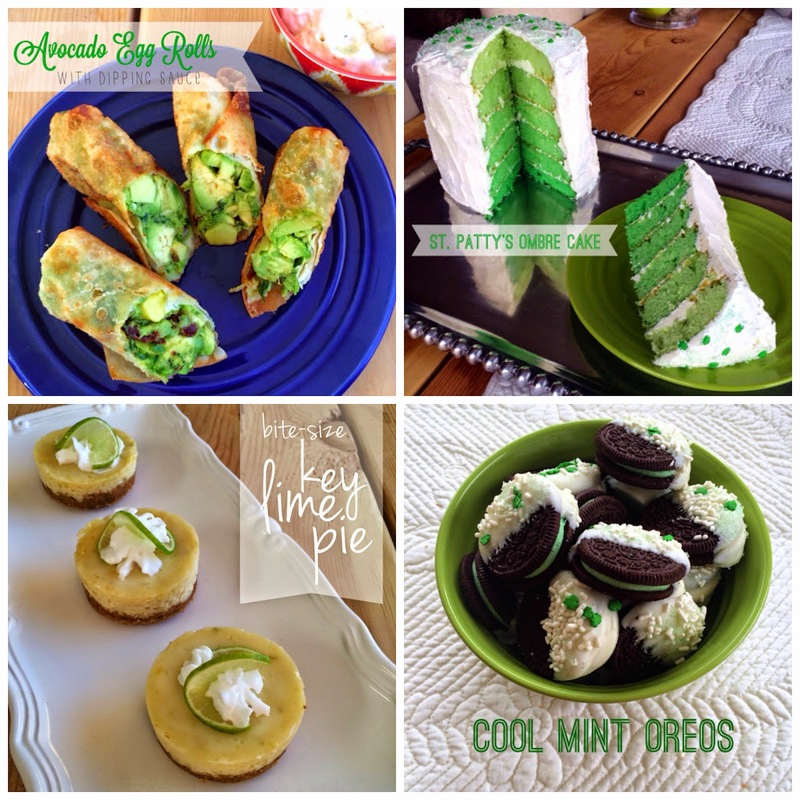 Those mini key lime pies look divine! I LOVE the earrings & phone cover :) I'm so lame, totally spaced out and didn't realize it was St Patty's day. I would have baked something fun! Love all the green picks! And those food choices -- I'm starving now! That kate Spade bag!!! I'm such a fan of green anyways - that purse is something I now need! Love the green tieks! I'm still dying to get a pair of any color. Do you have any? Oh yum - avocado egg rolls! I've had edamame egg rolls but avocado sounds amazing, too. Dying for a pair of those flats. I have heard great things about them! Love the phone case too! love the kate spade purse and i have those kendra scott earrings. so fun! Those fold-up shoes are PERFECT for going out on St Pattys!! I'd also love to make those cool mint Oreos :) Hope you had a great day yesterday. You had me at avocado eggrolls.... and that green scarf!!! ooh I'll take one of everything! esp the tieks! Love all of that! St Patty's Day is my favorite bc of my obsession with green :) I want all of those things!